Greek celebrity chef Argiro Barbarigou has designed a life and career from the Greek kitchen. If ever a human being can bottle and export the essence of Greek food and the spirit it embodies, it is Argiro. 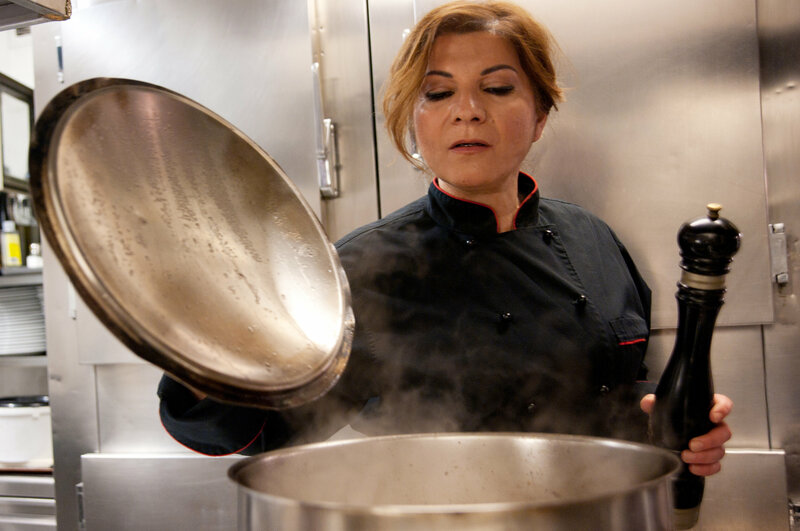 Known throughout Greece as the “First Lady of Greek Cuisine.” Argiro has devoted her life’s work to sharing the secrets from the Greek kitchen – modern and ancient – with her audience and fans around the globe. Following in the footsteps of her grandparents, she opened her first restaurant, Papadakis, in the mid-90s on the Aegean island of Paros, where she was born. Travelers flocked to her restaurant: day trippers from Mykonos and other islands, mixed with global glitterati, yet they all drank from the same simple glasses and ate her authentic food. It was here, that she found her core ideal ‘Nothing compares to a Greek mother’s, cooking.’ For Argiro, a mother’s cooking means familiar flavors, glorious tastes, openhandedness, warmth and unconditional love. It is these ideals that she has shared through her cooking, books, restaurants and TV shows, and it is her greatest goal to export this ethos to the world. Today, that culinary journey culminates at her second wildly successful Papadakis restaurant, set at the foothills of Mt. Lycabettus in the heart of Athens. Many say they first came for Argiro’s signature cuisine, but they return for her authenticity and infectious personality. Ambassador for the South Aegean European Region of Gastronomy, Chef, TV Host, Restaurateur and Best Selling Cookbook, she has designed a life, career and brand from the Greek kitchen, starting on her native Paros, where she credits her mother for teaching her not just the techniques, but the soul of Greek cooking, a love she shares in countless moments with millions of fans and customers.